Materials scientists at the U.S. Department of Energy's Argonne National Laboratory (Argonne, IL) have developed a way to weld components made of high-temperature superconductors. The welds form strong bonds that preserve uniform electrical flow across the joints. These welded units can be used for current leads, fault current limiters, energy storage devices, high-energy-density motors, and high-current wire or cable. High-temperature superconductors, which lose electrical resistance when cooled with liquid nitrogen, were discovered in the late 1980s. They hold the potential for generating more efficient magnetic fields and transmitting electricity without loss to resistance. Some applications are in use, but most ideas require large components. Researchers have been unable to grow large high-performance superconducting structures that carry current uniformly and have found it difficult to join smaller sections together without interfering with electrical flow. The new welding process may overcome this limitation. "This innovation is an essential, and long-awaited, key to widespread use of high-temperature superconductors in the electric-power industry," said Boyd Veal, a developer of the technique, in an Argonne press release. His colleagues included Argonne researchers Helmut Claus, Hong Zheng, Paul Paulikas, Lihua Chen, and George Crabtree. The new welding process bonds pieces of yttrium-doped barium-copper-oxide (YBCO) using layers of thulium-doped barium-copper-oxide (TmBCO). TmBCO's melting point is about 20°C cooler than YBCO. The materials are heated to a temperature about midway between their melting points. As the joint cools, the YBCO "seeds" the liquefied TmBCO, providing a template at the interface for the TmBCO to follow as it cools. This leads to a weld that preserves the YBCO crystal structure, is mechanically strong and carries high current. Superconductors are materials that lose their resistance to electrical currents at reduced temperatures. The first ones identified were metals that became superconductive when brought near absolute zero (-273.16°C). High-temperature superconductors, found in the late 1980s, lose their resistance at temperatures that allow the use of inexpensive refrigerants, such as liquid nitrogen, which forms at –196°C. YBCO, discovered in 1988, becomes superconductive at –181°C. 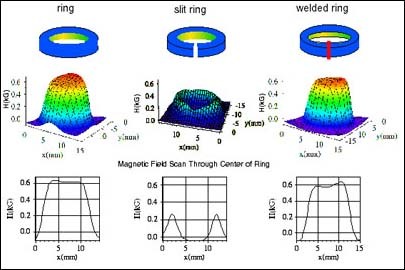 The superconducting welding method was developed under a cooperative research and development agreement (CRADA) with Superconductive Components Inc. (Columbus, OH). For more information, contact Rich Greb of Argonne National Laboratory at 630-252-5565 or rgreb@anl.gov.